My mother made Christmas beautiful and special. Not because of the beautiful table she set with her wedding china, or the candles or the presents under the tree. But because each decoration, every gift, every special touch was touched by love. 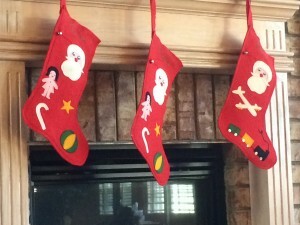 Perhaps my favorite Christmas item is our Christmas stockings. My mom made them sometime soon after she and my dad were married. She made one for herself and my father, then for me when I was born and later for my brother. When the family expanded, each new member received a stocking. They might be simple compared to the extravagant stockings you can buy today, but none compare in my opinion, because I know each stitch is embedded with my mother’s heart. And that makes these stockings priceless…and perfect…and full of Christmas love.